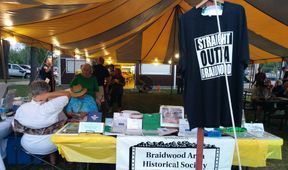 We had the Tully Monster & Braidwood Coal at Summerfest - July 21 & 22, 2018. And our coal car made the parade on Sunday. Available for purchase were ornaments, DVDs, coloring books, coal mine maps, T-shirts, and more! Visit us at the Museum!